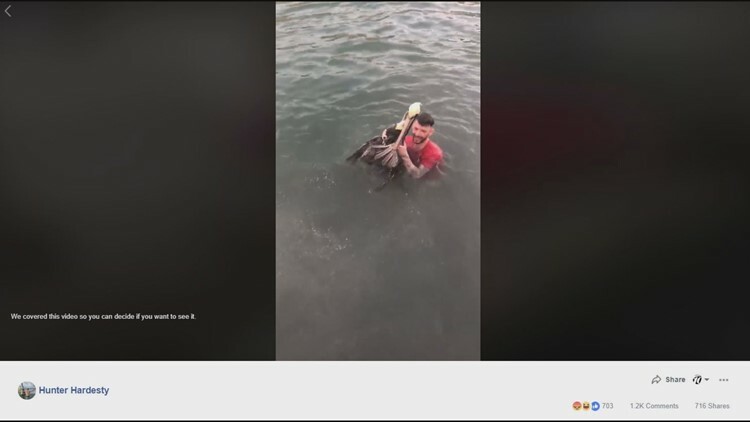 A Maryland man has caused a social media uproar after posting a video on Facebook that shows him jumping on top of a pelican in the Florida Keys. Maryland State Police said in a Friday release that 31-year-old William Hunter Hardesty was arrested at a hotel in Ocean City, Maryland. OCEAN CITY, Md. — A Maryland man seen tackling a federally protected pelican on video has been arrested on animal cruelty charges out of Florida. Maryland State Police said in a Friday release that 31-year-old William Hunter Hardesty was arrested at a hotel in Ocean City, Maryland. News outlets report the Florida Fish and Wildlife Conservation Commission investigated the video of Hardesty trying to capture a brown pelican at Florida's Key West Historic Seaport. The video was taken March 5 and posted on his Facebook page March 8. Monroe County State Attorney Dennis Ward told The Miami Herald the charges amount to five misdemeanors. Hardesty is being held as a fugitive in the Worcester County Detention Center, awaiting extradition to Florida. Reports didn't include comment from Hardesty, who's originally from Anne Arundel County.